When it came to redesigning the Ridgeline midsize pickup, the message came through loud and clear: “We hate the styling.” Specifically, the previous truck’s distinctive buttress between cab and truck bed. Rather than meeting at 90 degrees, squared off like Ford and the Lord Jesus intended, the rear window and bedside joined at 135 degrees, a phrase in sheet-metal like modern architecture, or the composite stock of a Heckler & Koch rifle. Honda’s new Ridgeline has been re-designed but will it finally resonate with consumers? WSJ’s Dan Neil joins Tanya Rivero with his review. 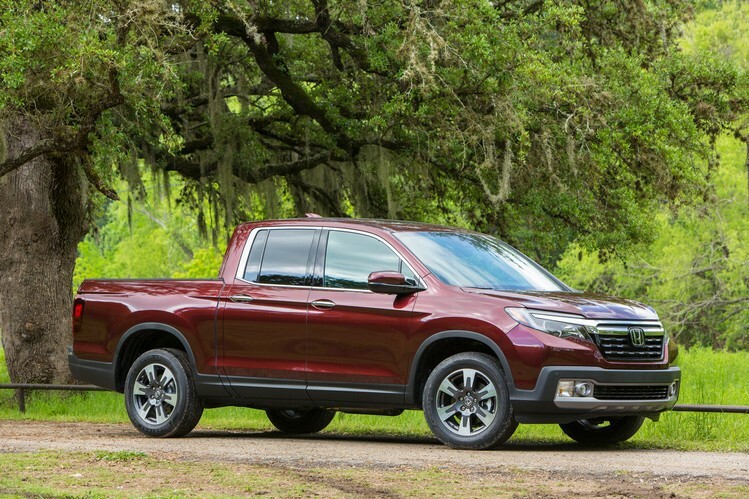 The buttress emphasized a story Honda wanted to tell: Ridgeline was a unibody design, like a car, as compared with body-on-frame construction. Unlike traditional pickups, where cab and bed meet at the right angles of their function, the first Ridgeline had no cutline behind the rear doors. The structure was tight as Tupperware, easy to drive and easy to love, with ingenious packaging and a host of firsts and bests: the weatherproof and lockable trunk concealed under the cargo bed; the magically disappearing rear seats; the cargo gate that swings both ways, if you don’t mind my saying. Happily, the best of Ridgeline’s innovations have been carried forward with interest. But the Ridgeline never got the love it deserved (250,000 sold in 10 years). Here, buried in the auto maker’s data I have found the reason: the buttress. It’s remarkable to think a machine as painstakingly design-engineered could be dismissed on such a basis. That this one angle should be a nonnegotiable feature of morphology? What a strange streak of fundamentalism. In any event, the designers have conceded the point. The 2017 Ridgeline’s silhouette features the requisite perpendicularity (95 degrees) at the backlight. In the words of my countrymen, that there’s a truck. And so dear readers, without delay, the boilerplate: the 2017 Honda Ridgeline, built in Lincoln, Ala., on the same architecture as the Honda Pilot, is a small/midsize pickup in the competitive set with Chevrolet Colorado, GMC Canyon, Toyota Tacoma and Nissan Frontier, and a couple of outliers. The segment totals about 350,000 units a year in the U.S., so it’s a proper pie for Honda to want a piece of. Under the notably less chiseled hood there is a single engine option, and it’s a star: a direct-injected 3.5-liter SOHC V6 with Honda’s valve and variable-displacement headgear. Among the nominals is a rated 280 hp, up 30 hp from previous V-6. Fuel economy is up nearly 5 mpg to 21 mpg city/highway combined. Those are giant steps. The fellers at Honda say you can carry two occupants and 110 pounds of cargo while trailering 5,000 pounds. Yeah. I say if you are towing/hauling anything like these loads regularly, don’t get a midsize pickup, regardless of who makes it. But if not, man, this truck is hard to beat. The why’s start with the dual action gate (fold-down or swing). Right there is the Ridgeline’s under-floor storage bin, big enough to hold an 82-quart Coleman cooler. Or you can dispense with the cooler and fill directly with ice and beer. There’s a drain hole. The cargo bed is quite the party zone. In addition to the keg cooler, our Black edition tester included AC outlets built into the bedside—for big screens, vaporizers, and so forth—and powerful speakers behind the composite bed walls. The truck-bed audio shuts off when the vehicle exceeds 10 mph. Next—and this is critical for the DIY market—the inside cargo bed dimension is 5 inches wider, now 50 inches, which means you can lay 4X8 stock flat on the floor. I am embarrassed to admit the buttresses I admired were crippling functionality. I love going to Lowe’s. 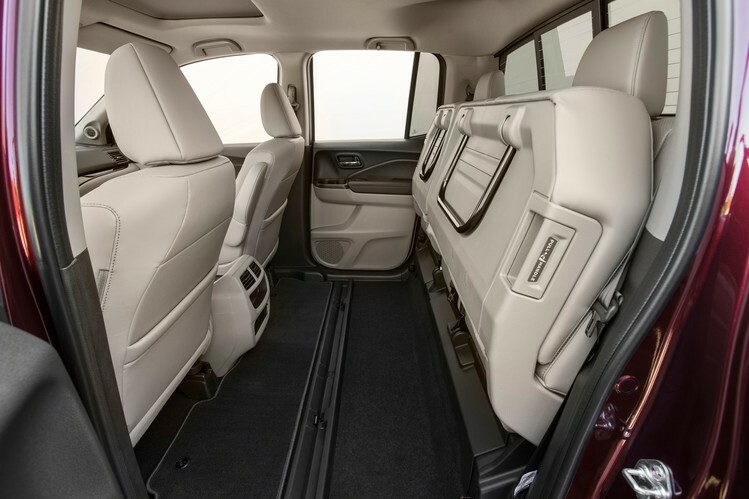 The ergonomics of the rear cabin: a total win. The rear 60/40 bench seat has a generous recline angle, and the seat height is raised enough to see the road. This is a huge deal if passengers tend toward motion sickness. When not needed the seat bench folds flat against the rear bulkhead, like a boss, opening up 50 cubic feet of tall cargo space, into which one can cram a full-size mountain bike, houseplants and other things that should not be folded. No if, ands or buttresses.